The Git Bash application is probably one of my most frequently used programs during a normal work day. One thing that’s really been a bug bear of mine for years now however is the default width of the window. It’s so thin that nearly every line of output gets broken onto multiple lines making it very difficult to read. Whilst I had a few spare minutes on my hands the other day I finally set about to look for a way to resolve this. 1. Right-Click on the git bash executable (otherwise known as sh.exe) and click ‘Properties‘. 2. Navigate to the ‘Layout‘ tab. You will see the ‘Width’ options defaulted to ’80’. 3. 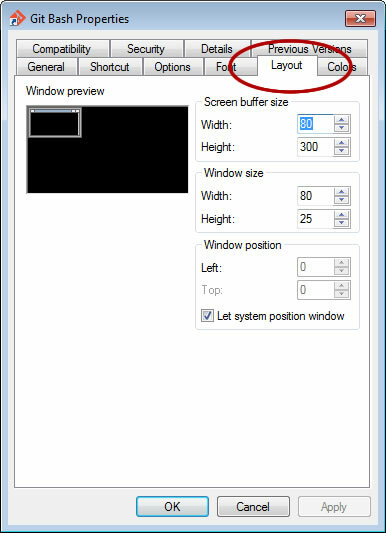 Increase these, both Screen buffer size and window size, to the required width. I set mine to 300 but you could go wider/thinner to suit your resolution. And voila… next time you load up Git Bash the window will be at a usable size. This entry was posted on Friday, July 24th, 2015 at 5:01 pm by +Steve Marks and is filed under Software, Web Development. You can follow any responses to this entry through the RSS 2.0 feed.